(15/111) TRENTON – Christmas in the Victorian and modern eras will be celebrated during the first two weekends in December with seasonal events scheduled at Ringwood Manor and Skylands Manor, both located in scenic Ringwood State Park in northern Passaic County, the State Park Service announced today. “Visitors to these spectacular venues in northern New Jersey will find a special, traditional holiday atmosphere that is ideal for celebrating the season,” said Mark Texel, Acting Director of the Division of Parks and Forestry. Ringwood Manor, which is listed on the National Register of Historic Places, is a magnificent 19th century house that was home to well-known American ironmasters in the 19th and 20th centuries. Situated on a low hill overlooking a bucolic landscape, the house is especially well-suited for visits during the winter holiday season. Skylands Manor is a 44-room mansion built in the 1920s to mimic the English Jacobean architecture common in the English countryside 400 years ago. It is located in the 96-acre New Jersey Botanical Gardens, which is part of Ringwood State Park. 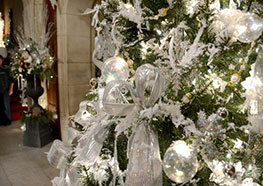 The decorating theme at Skylands Manor changes annually to have a very different look. Individual rooms are decorated by volunteers from northern New Jersey garden clubs, Master Gardener programs and local companies, as well as New Jersey Botanical Gardens members. Fee: $10 for adults; $8 for seniors; $5 for children ages 6-12; free for children under 6. Baby strollers not permitted.